But now I am on to it with loaded battery. 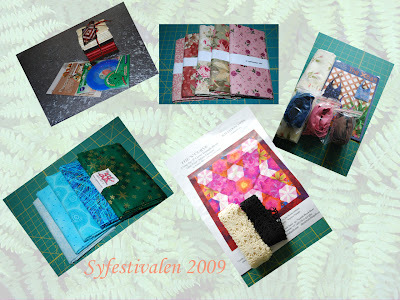 with some friends from my quilting-guild "Quiltkramarna"
those you know all about...or?????????? last week I received my package from my secret angel. Posting a package to Arlene, my partner in the "Advent swap"
What a wonderful post!! so many good things are happining!! Happy Birthday!! Perfect machine to take and go! I love all the other goodies you bought! I love the result of the Christmas mystery, so pretty!! The Japanese bag is really pretty, I cannot wait to see yours and your Halloween Quilt!! Also, what wonderful things you received from your angel! Thanks for showing the things I sent you, and it is relly funny, my oldest sun loven 2 and a half men also!